You are currently browsing the category archive for the ‘An Education’ category. As Oscar movies all move onto DVD and the summer late night movie watching season (that’s a thing, right?) begins, it’s time to highlight movies that you should check out. We’ve told you what, out of the movies to which we’ve given little coverage, you should skip, but there are plenty that you should watch! A satire about the decision to go to war in Iraq. Now take your notions about what you would expect from that description and throw it out the window. This is a workplace farce where every character is self-serving, back-stabbing, and blindingly stupid. Members of Parliament, cabinet members, generals, and speech writers jostle for position and influence to help determine a decision that has already been made. The writing is jam-packed full of jokes. It’s the type of film where you miss two punchlines by laughing at another. 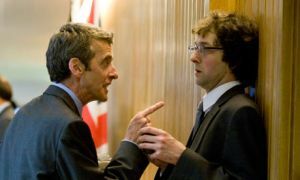 In the Loop is a semi-spin-off of British government farce sitcom The Thick of It, whose now dead American version was developed by the team behind Arrested Development. This is apropos since Loop‘s non-stop gag style reminded me of Arrested. It turns out the American version of the show just didn’t work because American television doesn’t allow the incredible profanity permitted in Britain. And, goodness, is that blue streak taken to new heights in Loop. If the slapstick jokes, the sly punchlines, the physical humor, the clever phrasings, or the bumbling characters don’t get you going, the inventive uses of swear words surely will. This is a film where everything just works. It’s a focused piece that avoids flash, dramatic scenes while hitting every note perfectly. The plot is a simple coming of age story. 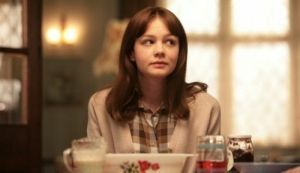 Carey Mulligan plays Jenny, a sixteen-year-old schoolgirls in 1960s London on track for Oxford. A smooth and mysterious David (Peter Sarsgaard) charms his way into her life. He represents quite a change from her boring life and she wonders if a life with him is better than the books at Oxford. We’re in well-worn territory here, but the writing and acting combine to produce a product where every element feels so right. The characters are complex and believable; in a word: real. I think the temptation is to make such a film lurid or overly dour as a precautionary tale, but instead I’d call it observative and wise. It’s very perceptive about the follies of youth without really condemning them. And Carey Mulligan puts it all over the top with a marvelous performance full of life and spirit. She does so much with a glance (look at the photo above!). What a talent. I also really liked Sarsgaard, who pulls off the creepiness without overdoing it. This is the kind of film that I put on while getting ready for bed just to appreciate for a few minutes and before I knew it I’d stayed up til 2am watching the whole thing. This film is fairly reviled by my colleagues who never saw an understated film they didn’t hate. But I can kind of understand why in this one. It’s a story about two officers (Ben Foster and Woody Harrelson) charged with informing the next of kin after soldiers are killed overseas and the inner demons they struggle with. The fireworks come when they deliver the bad news. Between these episodes it does meander narratively a bit too much. But, goodness, those next of kin scenes. They are so powerful. The soldiers banter in the car on the way there, steeling themselves for what they have to do without having to dwell on it. Then the knock on the door and the long wait to see if there’s an answer. Everyone handles the news differently, from screaming to anger to dazed acceptance. They’re an absolute emotional gut-punch. Check out the film for these scenes – though of course stay for the rest. We covered these a little bit more, but they are certainly well worth your time. Up in the Air feels like a slice of modern life, a comment on our current times. It’s grounded in some terrific performances from George Clooney and Vera Farmiga. One of those films that is great at making you feel, even if some of the plot points feel not quite right. District 9 thrives on its wonderfully inventive premise and a superb performance from frontman Sharlto Copley. Celebrate it for its originality and enjoy its pure entertainment value.